In the brave new world of computer gaming, where fantasy is premium (is history not fun/epic enough? 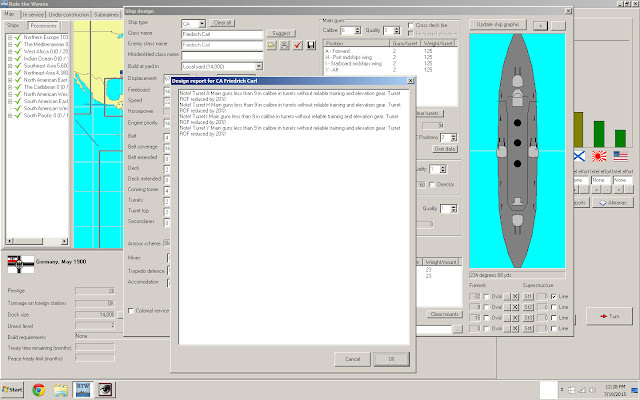 ), if I read a title sounding like "Rule the Waves" and the description "design your ships in a detailed ship designer" I would have not even payed attention. 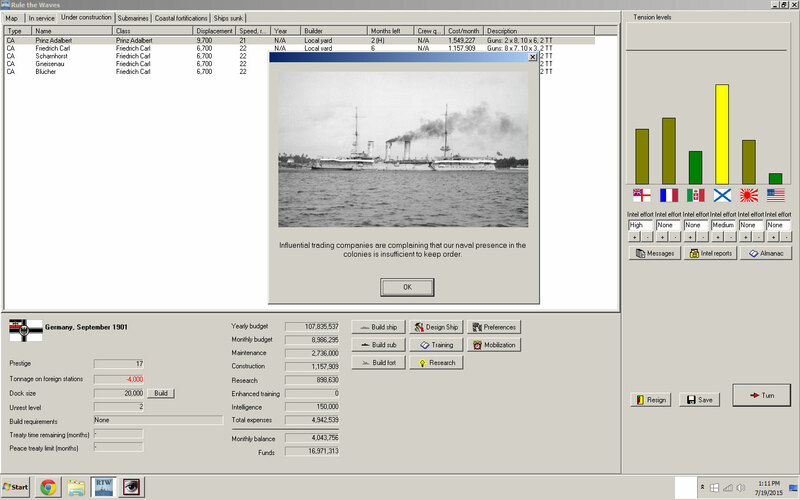 It is only because I love everything in the Steam and Iron line of products from Naval Warfare Simulations, that I bought Rule the Waves and I am here to tell you about this game. 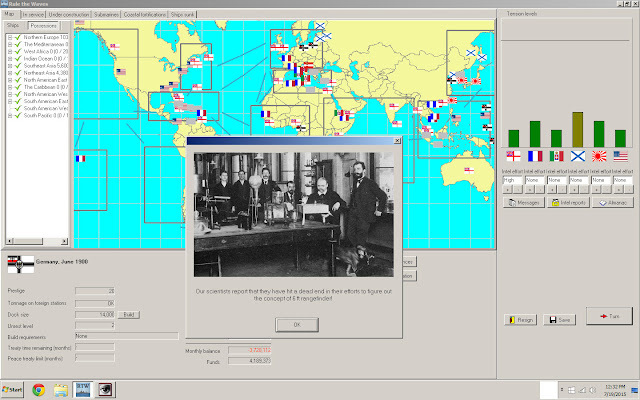 Rule the Waves (RTW from here on) is a game of global naval warfare with the player in charge of naval strategy, operations and tactical battles at the dawn of the 20th century. 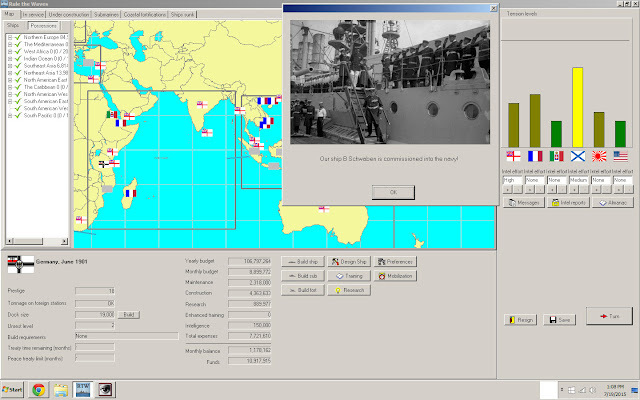 In its current state, RTW can be played as the major naval powers. The game main screen. 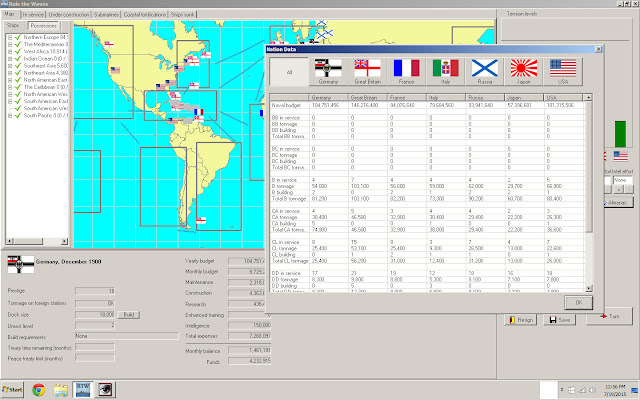 The dashboards and lists for the current state of the fleet are very clear. There are very minor issues, like not being able to open multiple windows for the regions getting in the way. But the amount of clicking to get the information needed is low. The player has a budget adjudicated by the government. 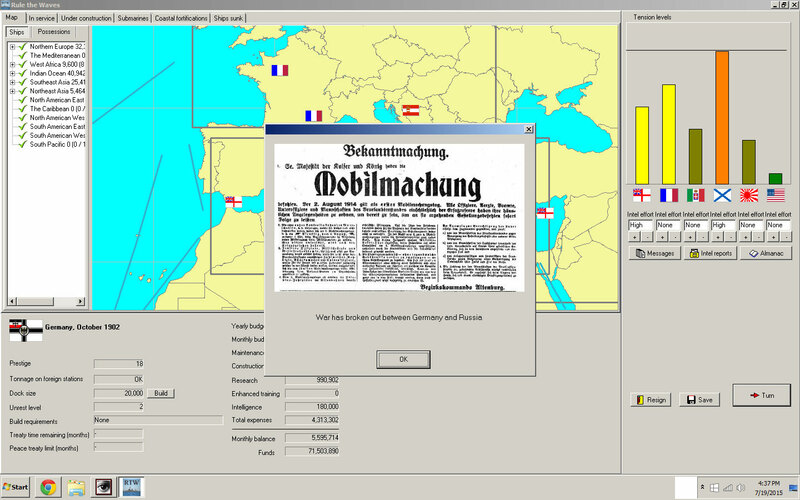 The player can invest its budget on many things like research. One thing that impressed me is how research and development is implemented. I'm usually very picky about this topic (I'm a scientist myself with many years of research under my belt) and none of my nerdy sensibilities were offended. Research is implemented as general topics (armor, engines, armor piercing shells, ship design, etc), to which the player throws money into and gets very specific results. You don't go and pick a specific technological advance and "research it". Instead, you focus on a general topic and the results show up, or not. In one of my games, I associated with the US and my technological advance stepped up significantly. Other thing that I like is how you can license technological advances from other countries. Or just spy on them. 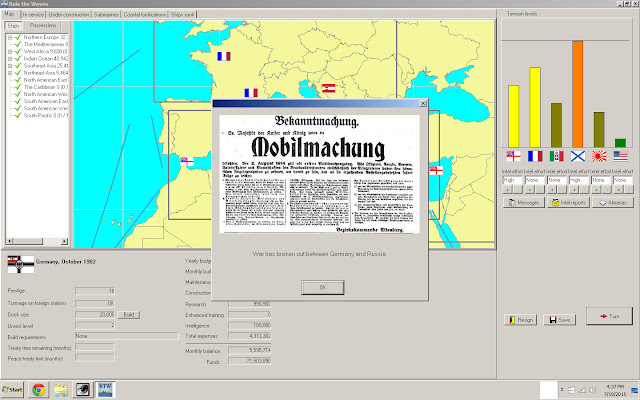 I couldn't shake out the Italians from stealing information from my German naval design bureau. I'm sure there is a "tech-tree" (oh man, how much I hate that phrase) inside RTW, but it doesn't show up on my face. And for that I praise the designers. No admiral in charge of a country's navy had ever to choose between researching an improved torpedo gyroscope or proper rings for heavy turrets. 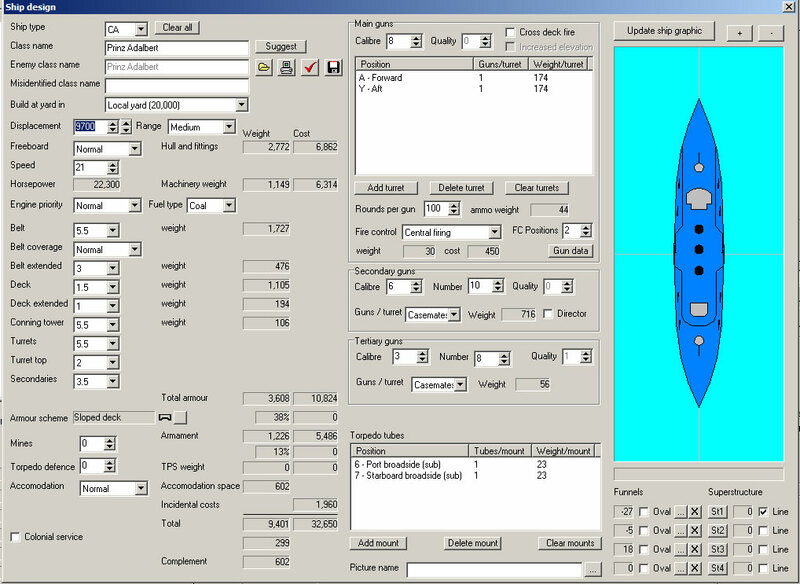 The ship designer. My engineers have spoken (front window report) and I'm OK with it. The ship designer offers a 2D view of the ship. 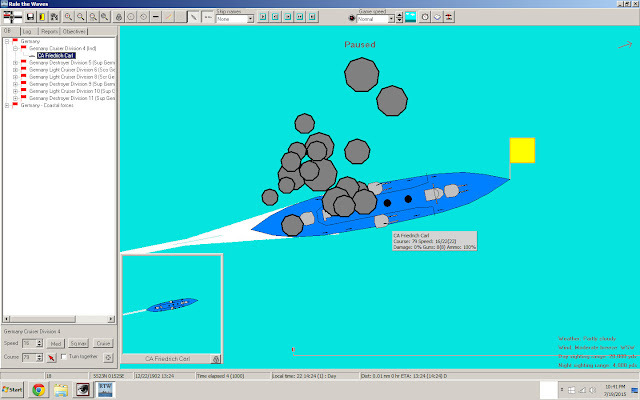 The player gets to play around with engine types, fuel types, armor, main and secondary guns. Be warned, you can't build a ship that defies the laws of physics or a ship that uses hardware that is not available yet. There is a button that validates the design and you will be getting a lot of warning messages about stuff that you threw on the ship and doesn't make any sense. Be patient. Again, remember that this is not a fantasy game but rather a game based in the challenges of ship building in the 1900's. I can't wait for the new toys to come out from the dry docks. Note the budget at the left bottom of the screen. I am spending too much already. Well, guys. Maybe if you don't keep dogs around the lab. you will solve it? Somebody said somewhere that the winners in complex situations would be those who can readily access to relevant information. Here it is a very helpful screen that shows the true naval balance of power. Just one click away! Building big ships takes years and it is a happy occasion to commission them. By the way, I balanced my budget, as you can see at the bottom left of the screen. The world map is divided into grand regions and you can send ships to these regions by using an interface. There is no representation of the ships on the map. 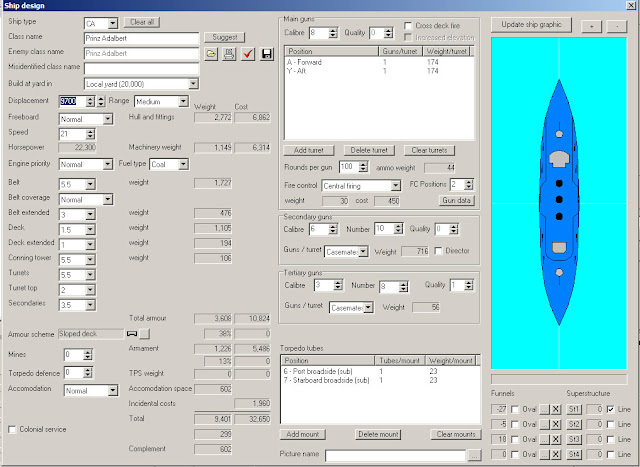 When you hover your cursor over the region, the amount and type of ships in it show up in a tool tip. Well, this is something that worries me a little. After years of simulated time, I got only one complaint about not protecting my merchant ships. 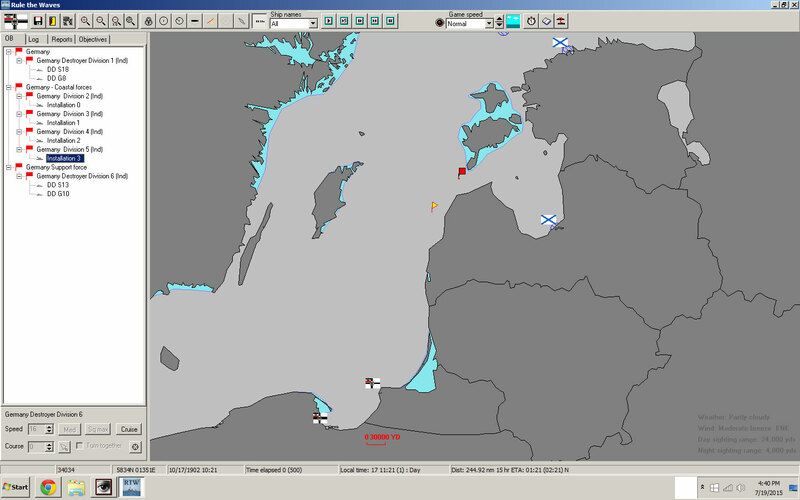 Keeping the seas open is the paramount mission of navies. I didn't see any type of explicit presence of merchant shipping (its tonnage, routes, etc) in my game play. From reading the manual, I see that there is some abstraction in merchant shpping, but merchant raiding, blockades and convoy attacks are possible. I played only as the Germans. 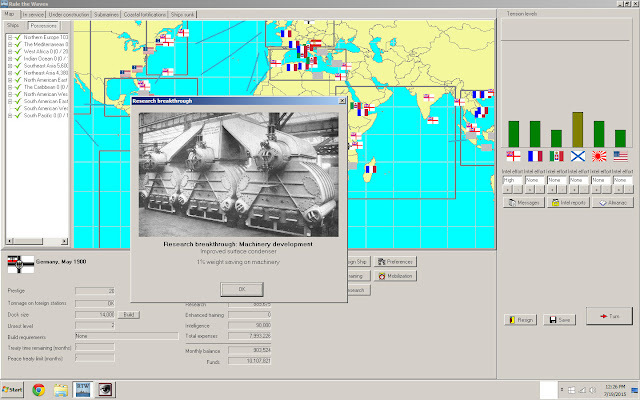 Maybe if I try playing as the UK some maladies about sea trading/merchants will show up earlier in the game. Oh ... balls! I'm at war with the Russians. What did I do to piss them off so badly? The levels of tension (the bar graphs on the right side of the screen) are a great way to keep tabs on your friends and enemies. I once vigorously protested against the blatant spying from the Italians and the tension levels with Italy went up. The war you are seeing the screen broke after I sent out a small task force into China. 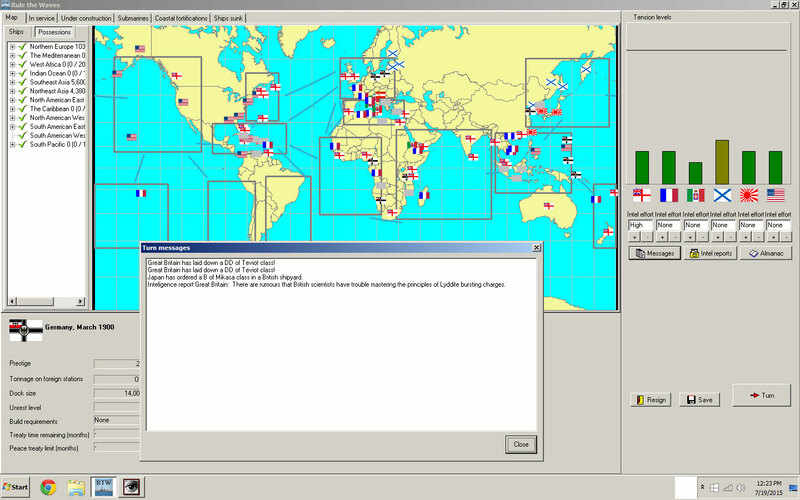 Once you are on war, the game will compute and generate battles within the regions where both enemy countries have ships. In this particular case, this is just a skirmish between destroyers. 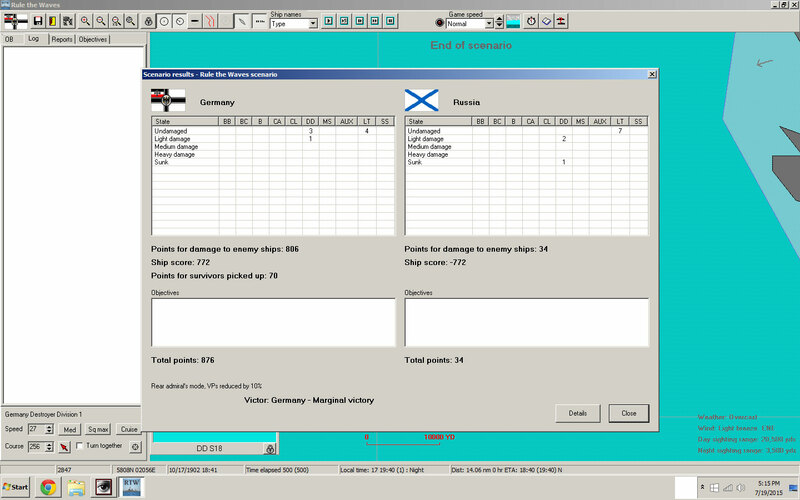 The battles are played in the regular Steam and Iron interface. The tactical battles are in a 2D map, exactly like Steam and Iron. Like in any other game linking different levels of war, the appeal of doing a good job is not only the prestige of winning a battle but also preserving your force for the duration of the war. The rate of attrition is slow. Forcing the enemy into a battle of extermination will be difficult without a good pre-conceived strategic posturing. The recently commissioned armored cruiser Friedrich Carl goes into battle. This is a ship I designed and I was itching for a good fight. Unfortunately, my fleet was not able to find the enemy and returned to port. 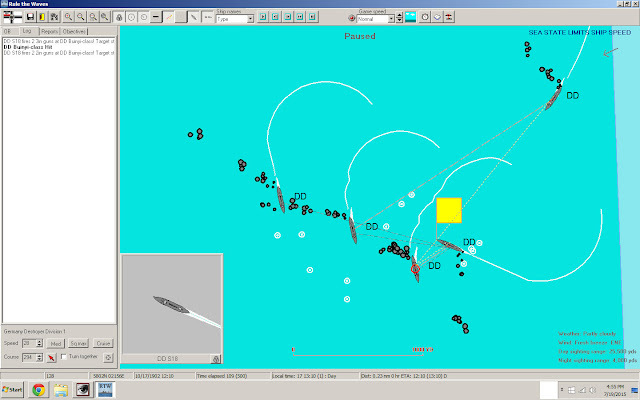 Rule the Waves is a naval strategy aficionado's wildest dream. The setting is exciting, the game design is very clever, and the game play is smooth as silk. The scope of this game covers naval strategy, operations and tactics. This is THE tour de force of early 20th century naval warfare. Can you purchase it via any other means apart from "steam" (pardon the irony)? No, these guys are ferociously independent. I not a "steam" user, and wont become one. Mark, I think that there is a bit of a confusion. 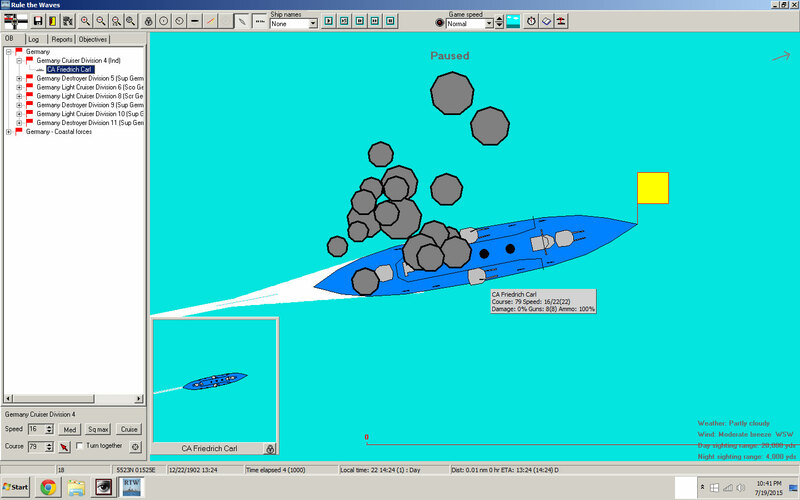 Rule the Waves sells directly from the Naval Warfare Store. No Steam account needed. About Steam, you got that one right, Mark. I am a Steam user just because a couple of games I play, which are not available elsewhere. Their pricing policies must be a killer for small game designers/companies. In addition to that, one of these days Steam will fart and we are going to be alone to figure out how to play the games we bought/rented. SAI with the Campaign expansion is absolutely superb. I'm obsessed with WW1..but not a big fan of Naval Warfare so Rule the Waves is prob off my shopping list. Saying that for those into Naval warfare it is most likely a must own. I want to see a Steampunk Mecha Mod:) Or want a game like this but to do with Steam Punk Mechas!